Although in excess of a thousand people have been killed, tens of thousands left homeless, and millions of people affected, the disaster is still unfolding as the rains continue and people are at risk of water-borne diseases, such as cholera, as well as further flooding and now starvation. In Mozambique alone, some 600,000 are in need of assistance and help, according to the World Food Programme. In total in the affected area, an estimated 2.6 million need assistance: houses are destroyed, crops ruined, infrastructure trashed, and livestock washed away. Elhadj As Sy, the Secretary-General of the International Federation of Red Cross and Red Crescent Societies, is one such person worried about the unfolding humanitarian crisis. There are fears that if and when the flood waters recede, the number of dead will sky-rocket. But at the moment, thousands remain stranded in an “inland ocean” of vast flood waters. “As the effects of climate change intensify, these extreme weather conditions can be expected to revisit us more frequently. 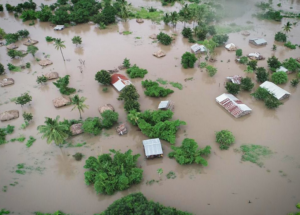 The devastation wrought by Cyclone Idai is yet another wake-up call for the world to put in place ambitious climate change mitigation measures,” adds Muleya Mwananyanda, Deputy Regional Director for Southern Africa for Amnesty International. The majority, if not all, those affected by Idai will have no insurance against events like this. But with ironic timing, one of the world’s largest insurers has said that climate change could make insurance cover for ordinary people much harder across the globe, not just in Africa. Ernst Rauch, Munich Re’s chief climatologist, told the Guardian: “If the risk from wildfires, flooding, storms or hail is increasing then the only sustainable option we have is to adjust our risk prices accordingly. In the long run it might become a social issue”. Cyclone Idai is a reminder that climate change hits the poor hardest. The rich nations carry on drilling for oil and gas, but it is the poor who will suffer. And where is the justice in that?